Learn how the EEU sets the standards for allergen challenge chambers around the world. Today’s EEU is a combination of tried and tested methodologies, cutting edge research and leading technologies. The EEU is more than a sum of its parts. Over the years, ongoing development combined with understanding, passion and expertise has led to the creation of a highly unique and specialized model to conduct allergy research. EEU researchers are unmatched in this field and have the experience to ensure that your research project can be successfully implemented in the EEU. The EEU is a large allergen challenge chamber capable of seating as few as 5 or up to 140 participants. The EEU is located within the Kingston General Hospital, a true advantage over stand alone facilities. Occupying a large room overlooking Lake Ontario and the St. Lawrence River, the EEU can accommodate small or large groups of participants for extended allergen exposure sessions. The EEU is centrally located in the hospital with the advantage of direct access to hospital facilities and services. Having a full emergency department in close proximity to the EEU is a pronounced safety factor during clinical trials. Proprietary systems and stringent monitoring ensure that the levels of allergen maintained in the EEU remain within protocol requirements. As the innovators of the EEU model, the allergen delivery system and ability to keep the allergen suspended in the EEU were the critical elements that allowed this model to move forward. The EEU allergen delivery system is proprietary and has been developed to ensure that allergen levels can be maintained continuously at predetermined concentrations in this setting. By delivering the allergen directly into the room and not through an air handling system, no specialized cleaning routines are required for the filtered air system and, consequently, this potential source of contamination is not a factor. An independent, world renowned Air Quality consultant verifies that all standards are met or exceeded by taking measurements during each study to document air quality and confirm that no other factors may be impacting on study results. EEU engineers and the specialized systems that they have developed generate allergen concentrations that can be maintained at the protocol specified levels. 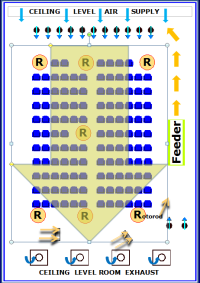 Seven Rotorod samplers placed within the participant seating area in the EEU directly measure allergen levels to confirm and document that the same concentration of allergen is delivered to the study participants. Stringent cleaning routines are in place to make certain that no residual allergen remains in the EEU between study visits. 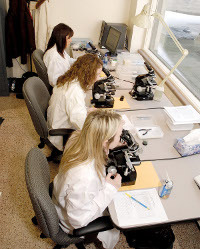 With these specialized systems and documented procedures, the conditions in the EEU can be reliably reproduced at each study visit, ensuring the very important requirement that participants in each study cohort receive the same allergen exposure and thereby allowing studies to be undertaken at any time of the year. The pioneering technology designed by Dr. Reg Clark was integral to the development of the EEU. Refinements which have been subsequently implemented have ensured that the allergen delivery in the EEU remains the benchmark in allergen challenge research. Symptom data is collected in real-time allowing an unprecedented level of error checking to ensure that data is as thorough and complete as possible. Many subjective or objective outcomes can be measured in the EEU to monitor medication performance or the status of participant’s allergies. Subjective symptom scoring is the preferred primary outcome and a sophisticated, real-time method of symptom reporting has been developed specifically for use in EEU studies. As participant in the EEU complete their symptom diaries at predetermined intervals, the symptom diaries are collected and electronically checked in real time. Should any incomplete diaries or errors be indentified, the scoring sheet is immediately returned to the study participant so that the missing information can be completed or errors corrected. By reviewing and capturing the data electronically in real time, it is assured that 100% of the symptom data is available for analyses quickly after the study is completed. Participant compliance is 100% and adherence to Standard Operating Procedures enables quality study results. The controlled environment of the EEU allows for constant monitoring of study participants by physicians, nurses and research staff who are always present in the room with the study participants. All procedures within the EEU are directed by a session leader to make certain that each study cohort receives identical study instructions and all protocol defined procedures are untaken in the same manner. Standard Operating Procedures are in place and strictly followed for all study related procedures to minimize data variability and ensure that study conditions are reliably replicated. EEU studies allow for 100% participant compliance and produce reliable, robust, high quality data, both significant factors which help to ensure that your study is completed correctly and on time. To discuss your research program and how an EEU clinical trial might be implemented in your development program, please contact us today.